Birds vs pigs and Star Wars theme music - what more could you want? Want to fling fowls against those dastardly snorting swine beyond your phones and tablets? Well, you're in luck. Today Activision and Rovio announced the arrival of Angry Birds Star Wars for the PlayStation 3, Xbox 360, Wii, Wii U, PlayStation Vita and 3DS in the U.S.on Oct. 29, 2013 with an international launch slated for Nov. 1, 2013. Newly remastered, the game will feature 20 exclusive levels created just for consoles that allow for unlockable bonus content, plus both competitive (2-4 players) and co-op (2 players) modes. All this adds up to over 25 hours of gameplay. The launch site is providing links for pre-orders from various retailers but so far only Wal-Mart has included a full run-down of prices. 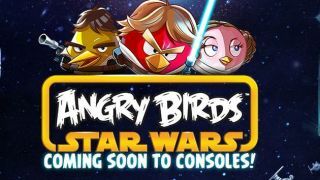 Looks a bit familiar, but with the Star Wars theme music and friends to play with, it seems like Rovio has a solid plan to invade practically every console out there. Read these blips, you must!